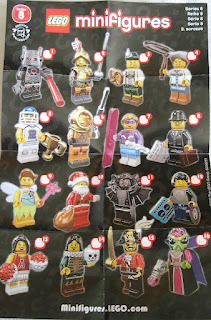 Have you been buying the newly released Series 8 minifigs? Are you finding the ones you want? 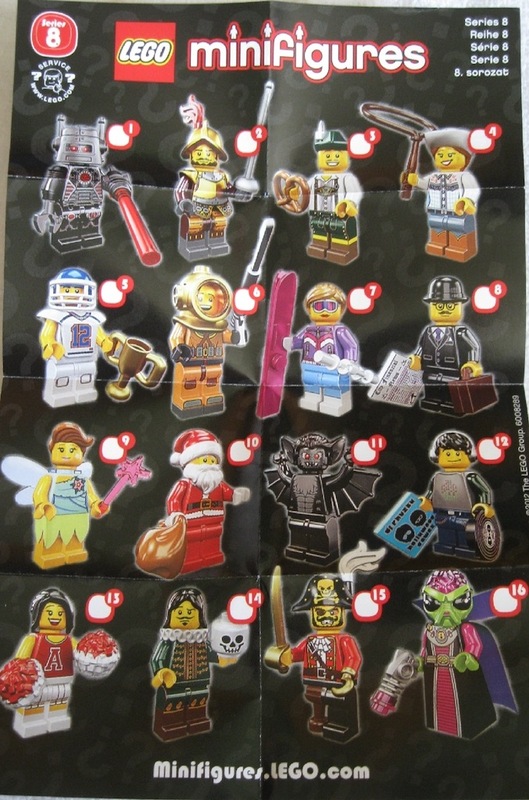 If you're struggling a bit to find that particular minifig to complete your collection, here's a little guide to identifying what's in the bag using the "touch and feel" method. 1. Evil Robot - try to find the helmet, it has a cylindrical shape with two small antennae pointing up. 2. Conquistador - finding the sword weapon will confirm you have this minifig - it is the same as the musketeer's from Series 4. The helmet can be confused with a hair piece from the other figs, and the armour can be mistaken for the footballer's torso gear. 3. Lederhosen guy - find the pretzel - that's the key. It is round, flat and has holes in it. 4. Cowgirl - be aware that her hat and hair are one piece. Or find the lasso - it's flexible. 5. Footballer - Look for the trophy - it's like a big goblet with handles on the sides. 6. Diver - just feel for the helmet - it's big, oddly shaped with the flat sides for the helmet's porthole. 7. Skier - the skis confirm it for this one - flat and long with a curved end. The hair can be confused for a helmet from the other minifigs. 8. Businessman - don't feel for the hat, look for the suitcase and the newspaper tile - a flat 2x2 square. 9. Fairy - look for the wings - it's one piece that hangs on the back of the minifig's neck. 10. Santa - You could feel for the sack he's holding, but his separate beard piece did it for me. It's small and flexible. 11. Vampire bat - look for the torso with arms that stick out at his sides (not pointing downward like the others), and the wings that are fixed to the undersides of his arms. He was the last figure I found. 12. DJ - feel for the square tile and the round tile. His hair with the headphones can throw you off. 13. Cheerleader - look for the poms poms - they'll feel like minifig heads with lots of bumps on them. 14. Actor - feel for the ruffled collar - it is flat, round and flexible. 15. Pirate captain - his cutlass weapon (flexible) and bicorne hat are the parts to feel for. 16. Alien Villainess - look for the 2x2x2 slope that represents her legs, it's all you need. I was skeptical about the touch and feel method at first, but it helps knowing what to look for. Have a copy of the sheet ready to assist you! Good luck in your minifig quest!